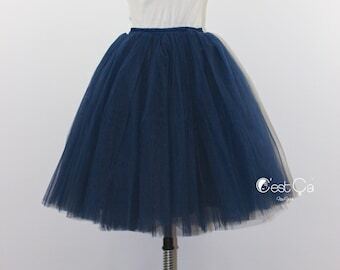 PLUS SIZE Clarisa Tulle Skirt, Tea Length Tutu, Blush Tulle Skirt, Adult Tulle Skirt, Wedding Tulle Skirt, Length 27"
High-quality tulle skirts, bridal tulle dresses, tulle and lace blouses, and other feminine pieces for brides-to-be and simply stylish ladies. Decorated bridal and maternity sashes are coming soon! Welcome to the fashion world of C’est Ça New York! C’est Ça (read – /sɛ sa/) means “This is it” in French. This is the place for classy and elegant clothes and accessories for those who love and appreciate feminine style in fashion. 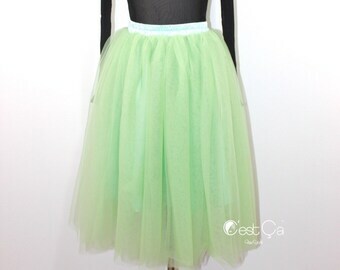 C’est Ça New York specializes in high quality handcrafted tulle and lace garments including skirts, dresses, and tops. 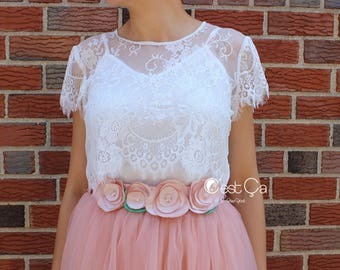 You can find many versions of tulle skirts and lace blouses online, but don’t compromise when it comes to quality. Trust the experts. C’est Ça New York is a team of dedicated professionals who love to create gorgeous quality vintage-inspired pieces that will last. 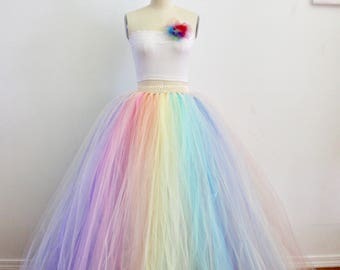 Clarisa - Blush Pink Tulle Skirt, Tea Length Tulle Skirt, 7-Layers Very Pale Baby Pink Skirt, Puffy Princess Tutu, Length 27"
I want to give the skirts themselves 5 stars because they are pretty and as described. However, getting them was a process. I'm pretty sure my order was put on the back burner because it took 2 months to get when other reviews stated less. When I got them, the colors were switched between the sizes. They responded quickly to my email and presented a few solutions, and I received the replacements about 2 weeks later. I paid for 5 layers, but only ended up receiving 4 in one of the skirts and have not heard a response regarding this. So I would recommend them, but allow yourself PLENTY of time! Such a fun photoshoot idea! Welcome to C'est Ça New York store, your destination for classy elegant fashion outfits for special occasions and every day life! 2.1 We gladly accept returns for exchange or store credit. 2.2. All quality issues have to be announced within 48 hours after delivery. 2.3. Any and all requests for returns or exchanges have to be announced within 7 days after delivery. C'est Ça New York has no questions asked return policy on eligible items. 2.4. All return packages have to be postmarked within 7 days after delivery (no exceptions) and received within 21 days after delivery. 2.5. Condition of returned items. All items sent back for return or exchange have to be in unworn unwashed condition with all tags attached and free of odors. 2.6. Items sent back for exchange have to include a note regarding an item you would want for exchange and a check to cover balance/exchange shipping. 2.7. Items sent back as a return will be issued store credit within 15 business days after return package was received. 2.8. Custom items. All custom orders are considered final sale. Custom orders include items with custom measurements, colors or design. 2.9. Returns of non-eligible items. Non-eligible for return items, items returned late as well as worn/washed/smelly/damaged while tried on items that were shipped back will not be accepted. These items can be shipped back to buyer within 45 days upon shipping fee payment. After 45 days all returned items that didn't comply with this policy will be donated to a local charity of the store's choice. 2.9.1. Due to the special occasions nature of our clothes and accessories, no returns are accepted after customer's event or deadline announced in correspondence took place. This clause was introduced to protect you and our future customers from accidentally receiving an item that was worn by somebody before and returned. 2.9.2. Late returns. Late returns shipped back within 21 days are subject to 20% restocking fee. Update: Starting March 4, 2015, we are no longer accepting returns or exchanges from smoking households if merchandise is not free of odor. If you live in a smoking household and not sure about an item fit or have any other questions, please let us know. We are always happy to provide additional measurements or take extra pictures. All and any items returned from smoking households that are not free of odor can be retrieved within 7 days upon shipping fee payment or will be washed and donated to a local charity. 3.1. We do not accept cancelation requests. Please contact us if you have any issues with your order, and we will do our best to help. 3.2. Custom orders and orders involved any type of customization cannot be canceled, returned or refunded for any reason. C'est Ça New York accepts all major credit cards, PayPal, and Etsy gift cards. 1.1 Processing time. Please pay attention to the processing time specified in every listing. We try our best to accommodate all requests, but might not be able to reduce processing time once an order is placed. Ready to ship items are usually shipped within 2-4 business days. 1.1.2 Rush processing. We accept only limited amount of rush orders. If rush is needed, please inquire about timeframe and fee before you place an order. After an order is placed, we might not be able to accommodate your requests. 1.2 Shipping. Your order will be shipped by USPS from Brooklyn, NY. Default shipping method is by First-Class mail with insurance (5-7 business days). You can also upgrade shipping to Priority or Express mail at checkout. 1.3 Upgrading shipping. If you would like your package to be shipped by Priority mail (2-4 business days) or Express mail (1-2 business days), please choose the mail class you need at checkout. If you shop from Etsy app and can't find Express shipping, please complete your purchase and email us at customerservice [!at] CestCaNY.com, so we can invoice you for the shipping balance. Your package will be shipped AFTER the invoice for upgraded shipping is paid. 1.4 International shipping. International orders are shipped by USPS International First-Class mail (delivery time varies by destination) with a registered number. Registered number shows location of a package within the US only. Other shipping means can be arranged by request. You will be invoiced for the shipping fee balance if upgraded shipping is required. 1.5 Shipping delays. The store is not responsible for any delivery delays while a package in possession of USPS or any other mail carrier or in customs. HOWEVER, if your package was shipped by Express mail and wasn't delivered within the timeframe guaranteed by USPS, we will file a complaint with USPS on your behalf to make sure you are reimbursed for shipping if your case qualifies. 1.6 Domestic delivery. Once package is marked "Delivered" by USPS, it's considered delivered. If you still didn't receive the package, please contact your local post office and your neighbors to inquire if they are in possession of the package. If your package is still not found and you filed a police report, please provide us a copy, so we can assist you in filing a claim with USPS as well. 1.7 International delivery. The store is not responsible for lost mail once a package is accepted by a shipping carrier what is proven by a tracking or registration number. HOWEVER, we insure all international packages and will file a claim with the insurance company on your behalf to make sure you are reimbursed for the product and shipping price if the case qualifies. Please note that insurance claims for international mail are allowed to be filed 45-60 days after an item is mailed only. That's the rules set up by insurance carrier. 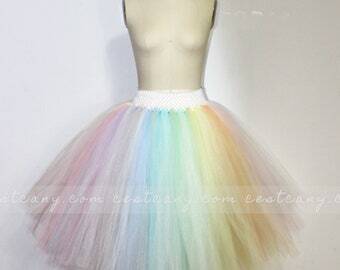 All our tulle skirts are CUSTOMIZABLE (size, color, type of waistband, number of layers, fullness)! 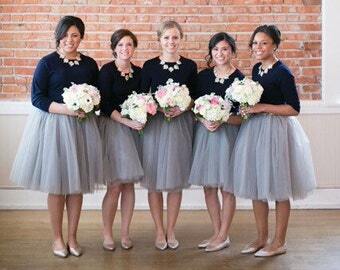 Feel free to describe how you see your dream skirt or send a picture you liked on Pinterest. 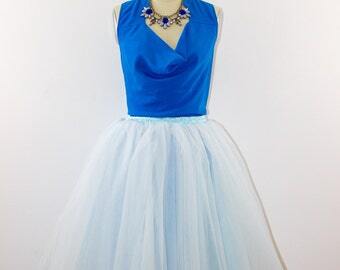 We work with a number of various tulle fabrics, and will be happy to help! 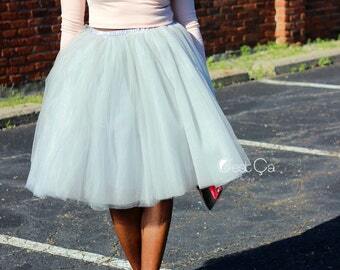 4.1 The majority of C'est Ça New York tulle skirts are made to order. Processing time slightly varies from time to time, but usually is appx. 4 to 8 weeks. 4.2 If you have a special deadline, please contact us in advance, so your orders can be processed quicker (rush order fees are applicable). 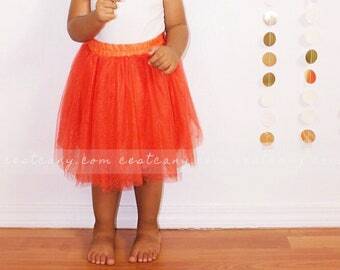 4.3 If you prefer to avoid rush fee, please inquire about READY-TO-SHIP skirts. Please include your waist measurement (or US dress size), height, and desired color(s) along with your request. 4.4 Ready-to-ship quotes are valid for 1 hour unless other stated or hold is requested. 4.5 Ready-to-ship items can be placed on hold for up to 24 hours. 4.6 All orders for ready-to-ship items that normally have processing time over 3-5 business days that were approved via Etsy convos or email have to contain a note regarding same. Please leave this note at checkout or contact us directly for the note to be added if not added at checkout. 4.7 WEDDING ORDERS. We strongly encourage to order all pieces meant for one wedding in one order to ensure all garments are sewn from the same batch of fabric. If you need to mix up different styles and achieve the exact same color, please contact us before placing an order, so we can discuss possible options. Feel free to ask any questions! We are always happy to provide extra measurements, pictures, add needed customization and/or accommodate any other needs you may have. Like the product but want it in a different color or special size? Just let us now by hitting "Contact seller" button or via email customerservice@cestcany.com. If you need to see a custom color chart, please let us know what designs do you consider. 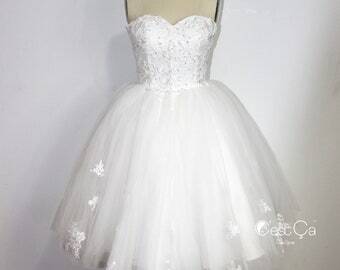 We use different type of tulle for different designs, so this info will help a lot. Yes, we do. In fact, our garments traveled to countries from Chile to Australia, and Saudi Arabia to China. All garments are carefully packed and shipped from Brooklyn, NY in the United States. I am from NYC, can I get my order the same day? Yes! Please contact us via Etsy or email customerservice@cestcany.com to ensure the garment you are looking for is ready. We can arrange same day delivery via UBER Rush. We would need to know your delivery address to quote the exact delivery price. So far, it's usually around $30. This option is available even if you are a hotel guest.